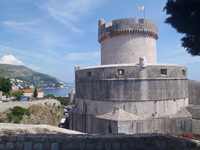 City walls of Dubrovnik form an irregular quadrilateral ending at each corner with strong forts. Tower Minčeta is the strong fort located in the North wall ending, facing toward the land. The name derives from the name of the Menčetić family, who owned the ground the tower was built upon. 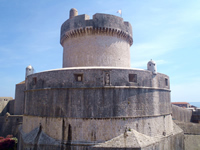 Minčeta, the highest point in the Dubrovnik defence system, is a large round fort with a massive base in the form of a huge covered outer wall. The fort is topped with a great Gothic crown that spreads over the side of the fort instilling the sense of power. The gothic crown is of negligible strategic importance and is more decorative in nature. The fort was originally built in 1319 as a high reaching quadrilateral fort according the designs of local architect Ničifor Ranjina. For over 100 years this design proudly served its purpose. However, after the fall of Constantinople to the Ottoman Empire (Turks) in 1453 there was much debate on reinforcing this important fort. 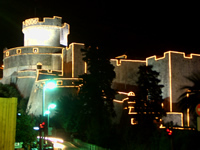 To help with the remake of the City walls the Dubrovnik Republic called for assistance the famous architect Michelozzo di Bartolomeo of Florence. Around the earlier quadrilateral fort Michelozzo built a new round tower adapted to the new technique of warfare and joined it to the new system of low scarp walls. The walls of the new tower were full 6 meters thick and had a series of protected gun ports. The building started in 1461. After the fall of Bosnia to the Turks in 1463, the works on the City walls hastened. The abrupt ending in the cooperation between Dubrovnik government and Michelozzo happened in 1464 when Michelozzo left Dubrovnik offended as his plans for the reconstruction of the Rector's palace were not approved. Following Michelozzo-s departure the work on the City walls continued under Juraj of Dalmatia (Juraj Dalmatinac) from Zadar, who also constructed the Cathedral in Sibenik. On Tower Minčeta, Dalmatinac built the bottom of the fortress and gave it the recognizable overhead part, the crown. 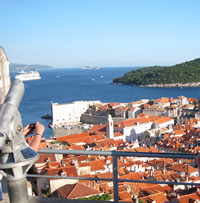 During his time in Dubrovnik, Juraj mostly worked on fortresses. He would have most probably left a more noticeable impact on the look of Dubrovnik if he had not ran from the City in front of the plague. In its active service Minčeta was armed with 9 guns among which was also one mighty bronze cannon, a masterpiece of Ivan Rabljanin who also made the Bell for the City Bell Tower. Today, as it was true in the past, Minčeta stands high above rest of Dubrovnik as a symbol of the unconquerable City Dubrovnik and tells the Dubrovnik story of love for the most precious sweet liberty. The fort provides a magnificent view of Dubrovnik and it is rightfully said that one has not been in Dubrovnik unless he/she witnessed the view from atop of Minčeta. In 1463 the Rector's palace was heavily damaged by a gunpowder explosion from the palace armoury. The renewal was entrusted to the famous architect Michelozzo di Bartolomeo Michelozzi of Florence who was working on the fortification of the City walls at the time. However, his plans, new and vibrant with Renaissance spirit, were not according to the taste of the notoriously conservative Dubrovnik Republic council so his plans were rejected on May 5 1464. Michelozzo left Dubrovnik soon after and the work was continued by other builders.